I discovered Louise Penny about five years ago, and she has quickly become one of my favorite mystery authors. 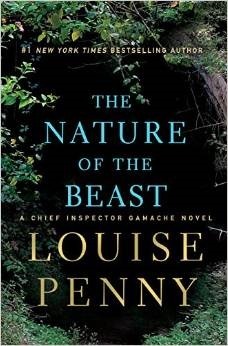 “The Nature of the Beast” is Ms. Penny’s eleventh title in her Chief Inspector Armand Gamache series, and this is the best book yet. In “The Nature of the Beast,” we find Armand Gamache living in the tiny town of Three Pines. He has retired from the his position as Chief Inspector of the Sûreté de Québec, but soon, he finds himself using his old detective skills. A young boy named Laurent has been found dead. An accident, the police say, but Armand is not so sure. Soon, his suspicions lead to a bigger, more ominous investigation as a terrible monster is found in the woods near the town. Ruth Zardo, the resident poet, seems to know more about this darkness that haunts the town than anyone else, yet she does not give Armand more than odd quotes and strange hints. Soon, another murder occurs, and it is clear that Armand and the rest of the Sûreté de Québec have their work cut out for them to find the killer. I loved this book, and very much enjoyed visiting with the residents of Three Pines. Louise Penny writes novels unlike any other mystery series available today. Not only do you have a true-hearted, intelligent detective, but you have a marvelous cast of characters. Penny mixes her mystery with culture, art, music, and deep thoughts. Excellent, and not to be missed. “The Nature of the Beast” is a good starting point for this series.